Maurizio Sarri has dismissed the latest round of speculation his time at Chelsea is coming to an end. With Chelsea sixth in the Premier League and in danger of missing out on qualification for the Champions League, Sarri's future is under threat despite taking Manchester City to penalties in the EFL Cup final. 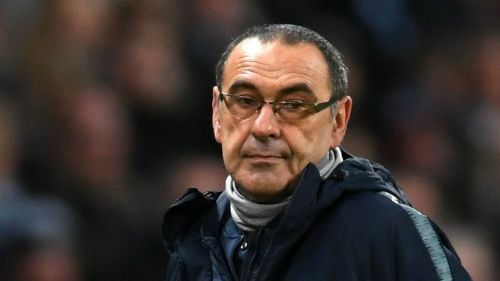 Wolves boss Nuno Espirito Santo is reportedly one of the names under consideration by the Chelsea board should Sarri be sacked, but the former Napoli head coach is not thinking about whether he will be in charge for the 2019-20 season. "I don't know. I don't mind at the moment," Sarri told reporters ahead of Thursday's Europa League tie against Dynamo Kiev when asked about his future. "For me, now, the next match is very important, and the next match in Liverpool against Everton. For me, the next season at the moment is too far [away]. "I want to be focused on these matches, first of all. Then we have the international break, and then a lot of matches – I hope, and I think – in the last part of the season. But we need only to be focused on our matches, the next two, which are very important. "We want to be in the top four at the end of the Premier League. And, at the end of the Europa League, we want to be in the final." Gonzalo Higuain is the headline absentee from Chelsea's squad for the game in Kiev, with Danny Drinkwater and Gary Cahill also left at home despite the English side holding a 3-0 lead in the tie. Sarri confirmed the striker is suffering from illness so is not being risked ahead of Sunday's Premier League game at Everton. "He had a fever after the match in the Premier League, for two days," Sarri said. "So yesterday evening, we with the doctor decided to leave him at home to recover for the next match." Chelsea are highly likely to progress to the quarter-finals having established a strong lead in last week's opening leg, but Sarri is concerned about the surface in Kiev. "A disaster. The pitch is not good," Sarri stated. "I think that it's dangerous, really dangerous. It's really dangerous to play any football here in this moment, and I think it's really very dangerous for injuries. But the situation is this, so we have to accept the situation. "We have to play on this pitch. There isn't another solution, but I cannot understand why UEFA are so, so... haven't really given much attention to everything, especially to the player list. "You have to present the player list at a certain minute, and then we have to play on such a bad pitch. The situation is this, though. I think it will be very difficult, also, for Dynamo because the pitch is no good. "It's a problem for us, but also for our opponents, I think. I don't know the reason - probably the winter. I played here two years ago and the pitch was wonderful. [Now it is] Very, very dangerous."